ENTERPRISE — Life Flight transported one man to Dixie Regional Medical Center after he was ejected from a truck Thursday morning on state Route 18 and Main Street in Enterprise. At approximately 9:45 a.m., a white GMC van with three passengers was exiting the parking lot of the Sinclair service station, located near the intersection of SR-118 and Main Street in Enterprise, said Utah Highway Patrol Sgt. Todd Royce. 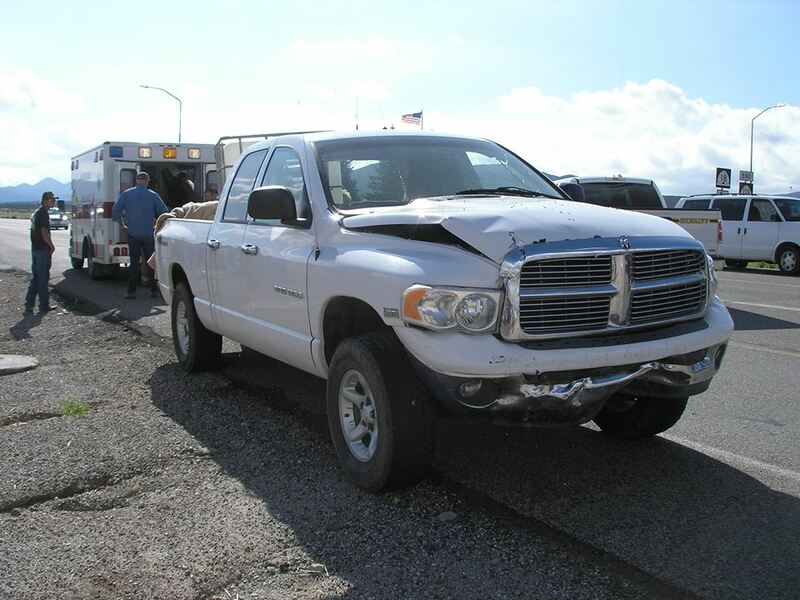 At the same time, a white 2003 Dodge 1500 truck containing two passengers was traveling westbound on SR-18 at about 55 miles per hour. As the truck neared Main Street, the van pulled into the intersection in front of the truck, according to a statement from the Utah Highway Patrol. The truck struck the van in the left rear quarter panel, and the force caused the van to spin counterclockwise, the statement said. As the van spun, a man sitting in the backseat on the left side was ejected from the van out of the left rear window. “The man who was ejected was not wearing his seat belt,” Royce said. The ejected man was transported via ambulance to the Mountain Meadow parking lot and then taken by Life Flight to the hospital in critical condition. The driver of the truck was transported via ambulance to Dixie Regional Medical Center with injuries that were not expected to be life-threatening. Due to information gathered during the investigation, it is believed that none of the people in either vehicle were wearing seat belts, according to the statement. on hiway 15, i left the roadway just a tad and overcorrected i think.. some ppl think i may have been slightly bumped…. i ended up in a spin knocking down parts of the guardrail and flinging past the lanes and off the shoulder running parrellel at an angle til i finally stopped.. we spun several times and i am told we may have rolled and came back on all 4 wheels at one point too as the top of the car showed some rounding.. i just remember not being able to get a clear picture of anything, just swervy colors… the whole time, my child in the back giggling.. thru the whole ordeal.. when i came to rest.. we neither one had a mark on us.. thank you Jesus and thannnkkk youuu seat belts!!!! Isn’t 55 a tad fast for in town traffic ? Doesn’t the speed limit drop before the business intersection ?